Some of my earliest childhood memories are from our family trips to Vacationland Resort on the Cisco Chain of 15 Lakes in Michigan’s Upper Peninsula. Every summer from the ages of 7 through 17, my family (mom, dad, two sisters, me) spent a week in a cozy cabin on the lake. The days were filled with activities outside: swimming, fishing, boating, skiing, and tubing. Nights consisted of bonfires and night games. It was the perfect getaway to enjoy quality time with family and the beautiful outdoors. Dad was always the captain of the boat and was known as the best boat driver to tube with - he took no mercy on us (until my overly cautious mom as the spotter would have enough and scream SLOW DOWN!) And we loved every second of it. When I was 10, my parents bought a cottage on Pewaukee Lake. It was the perfect lakehouse as it was only 15 minutes away from our home in Brookfield. Every summer weekend that we could, we spent at “the Boathouse,” named for obvious reasons because it literally is a house in the shape of a boat. Looking back, I realize how wonderful the lake life has been for bringing our family together and creating special memories. Watching TV was never an option at the lake, and since the Boathouse is only 1000 square feet, it was impossible to hide from one another. If we weren’t on the water or outside playing bocce ball or volleyball, we were inside playing games. It was another special place with those good lake life vibes. Fast forward 20 years to 2017 - and here I am as the owner of the famous Boathouse, living in it with my husband and two babies. Although the house looks a little different, the special feelings still exist. What is even more special is watching my husband start to create lake life memories with our children. 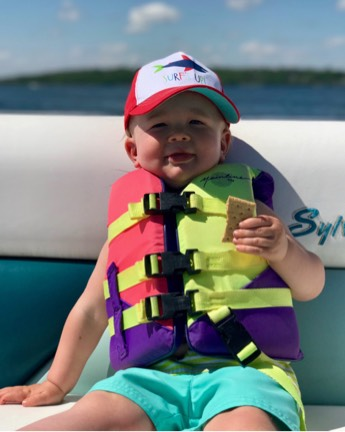 We love to “party in slow motion” on the pontoon with our 19 month and 4 week old babies, fish, kayak, have bonfires, and enjoy every magical sunset the lake offers. I have my dad to thank for introducing me to this special way of life and allowing me to continue to live it with my own family.